I love potatoes. So much so that sometimes I eat so many that I think I’m going to become one: soft and squishy. I don’t really know anyone who doesn’t like potatoes, at least in some form or other. And that’s the beauty of potatoes, they can be made so many different ways! Potatoes are most definitely my favorite non-leafy green vegetable. I’ve been known to have mono-meals of just mashed potatoes. When I was little, my mom would always order me just a side of mashed. I’d be the happiest kid ever. Some kids like to lick cake batter off spoons, I would be most excited when my mom let me lick the masher after she mashed potatoes. I’ve been on a major mashed potato kick lately. Mike bought a giant bag of russets and we’ve been working our way steadily through. So far, I’ve made mashed potatoes twice and Mike has made them once for shepherd’s pie. He made two of them dinner one night, from two different authentically British recipes. One was a Jamie Oliver recipe and one was a Gordon Ramsey one. We both thought that Ramsey’s pie would be the winner, but in the end, Oliver’s stole the show! But, the truth was, both pies were awesome: the British seriously know how to do potatoes. Not only do they do awesome things with mashed potatoes (the afore mentioned shepherd’s pie, chips, bubble and squeak), they also make the best roasties on the planet. 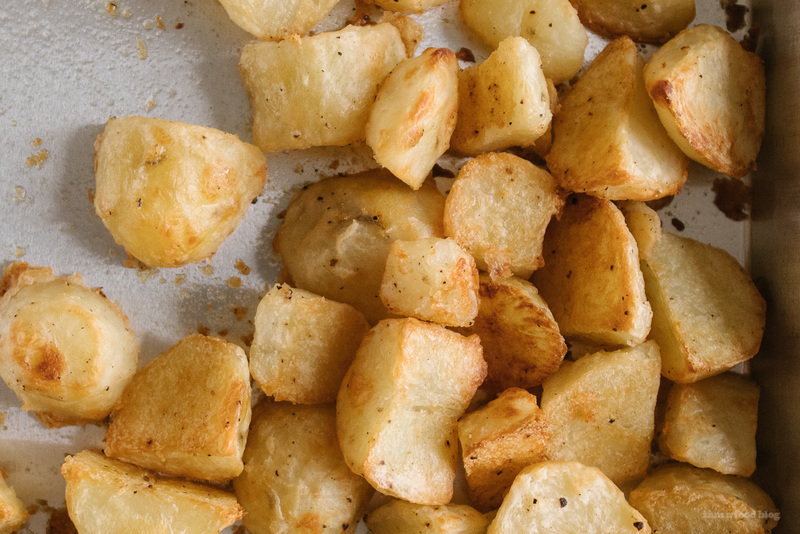 There’s just something about British roast potatoes. They’re insanely crisp on the outside and are light, fluffy, and creamy on the inside. I just love them. 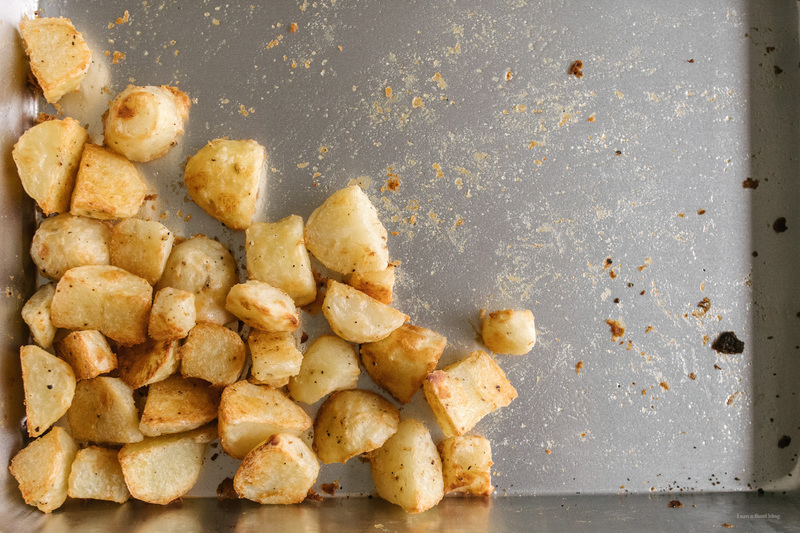 These guys are a super simple duck fat roasted potato, in the classic British roast style. 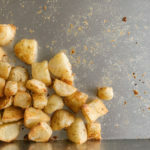 The potatoes are peeled, boiled until just tender, drained well, roughed up a bit for extra texture, tossed in fat, and then roasted until golden and crisp. I made them to go with the turkducken roulade for our Canadian Thanksgiving feast and dare I say, the were the best part? On a side note, Mike and I stayed up late on Wednesday in hopes that we could book a camping spot in Oregon next August, for the full solar eclipse. There’s a huge swath of America that will be in the path of totality, making it a rare chance to see a full total eclipse. We were lucky and got one – I’m super excited!! 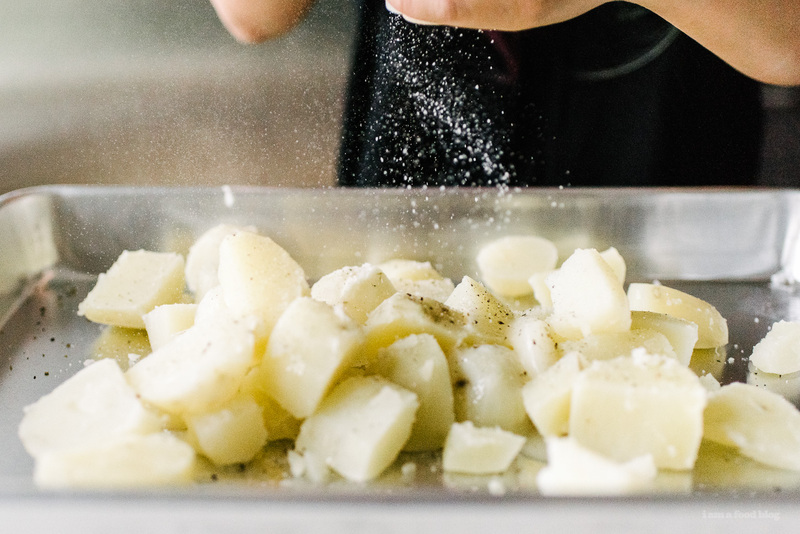 Peel the potatoes and cut into even 2-inch chunks. 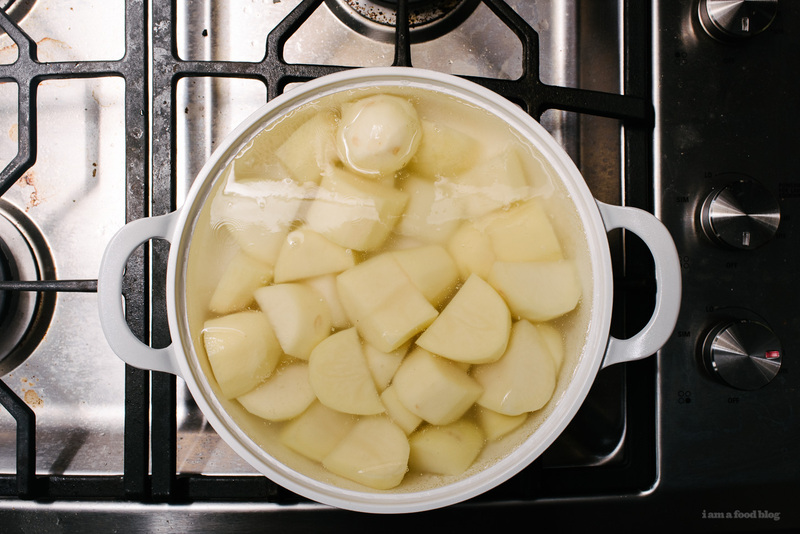 Rinse the potatoes and place in a large pot covered with cold water. Bring to a boil. Once the water comes to a boil, and cook for 5 minutes. Pour into a colander and let drain. Shake to roughen up the edges. Put the potatoes on a baking sheet or oven safe roasting dish and toss with the duck fat. Season generously with salt and pepper and toss well. Roast the potatoes for 30 minutes until lightly golden. Toss and roast for another 30-40 minutes until deeply brown and extra crispy. 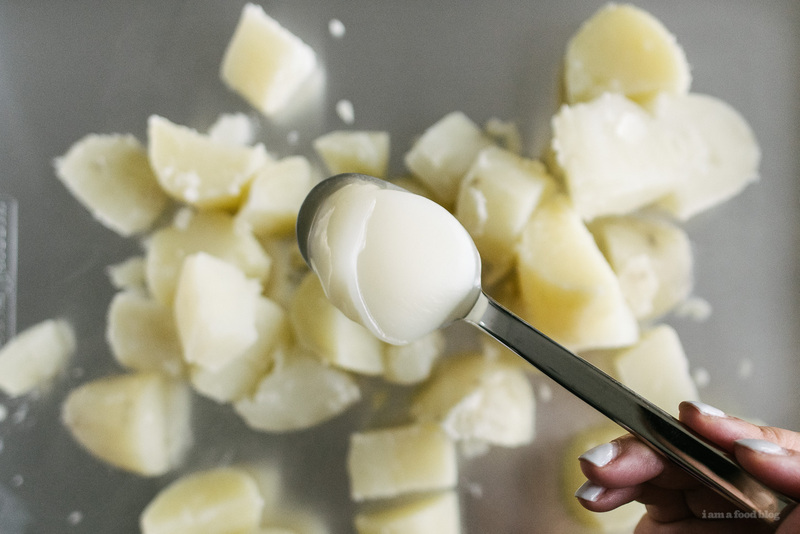 Do you have to melt the duck fat before tossing the potatoes in it? Or does it melt on its own if the potatoes are still hot? it will totally melt onto the just boiled hot potatoes, it has a very low melting point. but if you feel more comfortable or if your potatoes have cooled down a bit, feel free to melt it a bit! These look seriously delicious. I am also a huge potato fan. To be honest I’ve never roasted potatoes in duck fat before so I must try this. I love potatoes and never thought of them as non-healthy. I am baffled as to why you think so. Roast potatoes are among my favourite and King Edward (if you can find them outside of the UK) make the best, in my opinion. I have been told there are two – well, three – secrets to making perfect English-style roast potatoes: one is to drain them really well, then sprinkle them with pepper and give them a good shake, and last and most importantly, while the potatoes are boiling, thinly coat your roasting pan with fat and heat in the oven until fat or oil is sizzling before you put the potatoes in, otherwise the potatoes will absorb the fat and will taste of it or not become crispy enough. You can also roast them in goose fat or in olive oil. ooooh i would totally eat a whole bowl of these. YUMMm. I’m so much making these tomorrow. But with goose fat.